At first touch, this jacket feels like reinforced plastic sheeting. It weighs a mere 3.3 ounces on my scale. 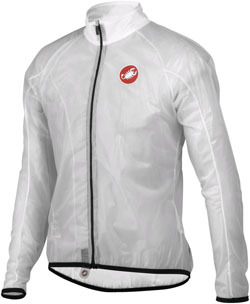 But the Sottile Jacket, new from Castelli this spring, can add a significant layer of protection against the elements. 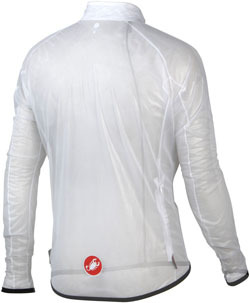 Made for cycling, the wisp of a jacket is listed as “transparent” in color on the company’s website (www.castelli-us.com). Indeed, logos on a jersey are readable through the thin polyester ply, which is marketed as breathable and wind resistant. There’s some stretch to the fabric, making it fit comfortably and move as you move while biking. I ran in the Sottile, too, and the shell was fine for about 2 miles on a windy, 60-degree evening. After that — about 15 minutes into the run — the jacket started to feel clammy. But on a bike, with wind and minimal upper body movement, I found the Sottile to be comfortable for long periods. It has a full zip for easy on and off. There’s a small zippered opening on back for access to a jersey pocket. Small swaths of underarm mesh aid in breathability. Water beads and runs off the fabric’s face. Due to its packability, Castelli markets the Sottile as an “emergency shell” — not a full-on rain top. But in my test it worked suitably during a sprinkle. I stayed dry inside, and the jacket breathed enough to keep me from overheating. Castelli has created a neat new product with the Sottile jacket. It folds up small enough to stuff inside a jersey pocket. It costs $79.99 and comes from size small to 2XL. About the jacket’s name: The word “sottile,” according to an online Italian-English dictionary, means “thin, delicate, slender, slim, small, shrewd, sharp, fine, keen, subtle, slight.” In more than one way, those words sum up Castelli’s smart new cycling top. —Stephen Regenold writes a blog on outdoors gear at www.gearjunkie.com.